Did you know that May 18th is I Love Reese’s Day? It’s true! A day dedicated to celebrating the awesome deliciousness of Reese’s! Not sure how to celebrate this special day? Here are 5 yummy ideas that you may want to try. They all involve the delicious mixture of peanut butter and chocolate in these Reese’s Peanut Butter Cup recipes. 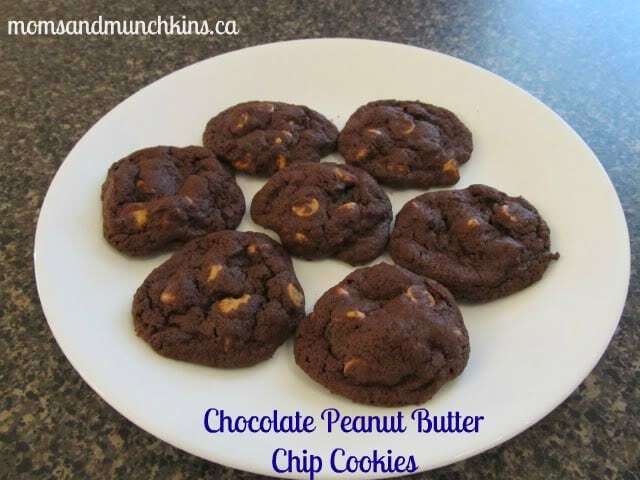 1) Chocolate Peanut Butter Chip Cookies – or as my friends call them…the OMG Cookies! See the picture below to commence drooling. I haven’t made these for a long time because honestly…I can’t stop eating them when I have them in the house! 2) Mix vanilla ice cream with chopped or mini Reese’s Peanut Butter Cups. There’s no better ice cream mix-in than peanut butter and chocolate! 3) Top a chocolate cake with rich chocolate frosting and chopped or mini Reese’s Peanut Butter Cups. Looking for a recipe for delicious caramel chocolate cake? Click here for Chocolate Caramel Skor Cake (just replace the Skor bits with chopped Reese’s Peanut Butter Cups). 4) Melt Reese’s Peanut Butter Cups in the microwave (just a few seconds) and use as icing for mini cupcakes. These would taste delicious with a big glass of cold milk. 5) Bake these delicious brownie cupcakes (minus the pecans) and as soon as they come out of the oven, take an unwrapped Reese’s Peanut Butter Cup and push it into the center of the cupcake (push down until the top of the peanut butter cup is level with the top of the cupcake). Let cool and enjoy! Do you have any Reese’s Peanut Butter Cup Recipes you’d like to share? Do you have someone in your family with a peanut food allergy? If so, I’d love to hear your favorite chocolate bar ideas! My son has a peanut & tree nut allergy. He’s not to the stage of eating chocolate bars yet but I do need to start thinking of safe treat options for him. Let me know in the comments below! Stay updated on all the delicious ideas by following along on Facebook, Twitter, Pinterest and Bloglovin’. 17 days left! How exciting! I’ve never heard of this day before, but I sure need to celebrate it. I started celebrating today. 🙂 You can never be too early for a holiday involving chocolate! Thanks for stopping by!